The North Coast 500 is the best road trip in Scotland. It has been called the route 66 of the UK and will show you all the nature and wildlife of Scotland. Road trips began to become popular in the United States with the introduction of the famed Route 66. The route gives the ability to cut the country right through the middle and see it all. No routes have ever been able to live up to the experience of driving this famous road until now. Finally, it has a rival in the North Coast 500, the ultimate road trip in Scotland. Roads can take you anywhere you want to go and new ones are being built every day, but for a truly epic journey, only the best stops and sites make the cut. Along the North Coast 500 there are many wonderful places to visit, have a bite to eat, or find something fun to do for the whole family. To enjoy your time in Scotland to the fullest I recommend you purchase one of the two travel books below. 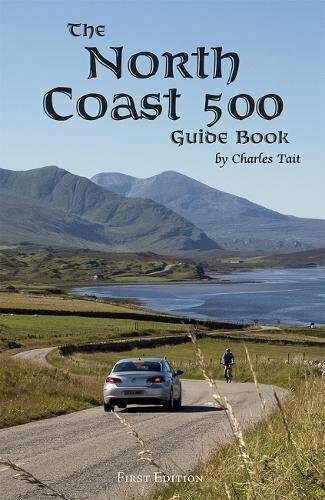 These awesome NC500 Travel Guides take your through the beautiful landscapes of Scotland and tell the story through the eyes of the traveler and include many useful tips to make your journey a success! 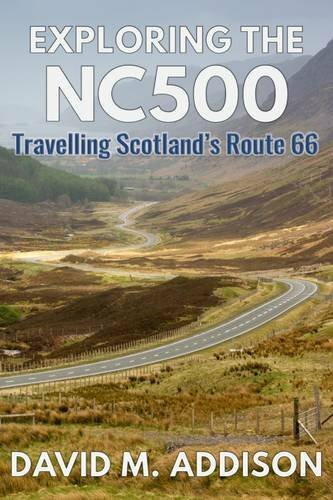 Check NC500 Books Lowest Price on Amazon UK – Click Here! The best experience is to take the route all the way trough the Northern part of Scotland. That way you are sure to see the important ancient castles as well as the historic towns that make up this beautiful country. You will be traveling to some remote parts of the country, therefore I recommend you buy a simple map of the North Coast 500. It only cost a few bucks and it will be a lifesaver if that GPS or phone signal disappears.. Trust me! Click Here to Get Your Very Own North Coast 500 Travel Map Now! Renting a car in Scotland is easy. Depending on which airport you arrive there are several options available, which include nice looking cars and campers from international rental companies. You will need a valid EU License or an international driver’s license if you are from outside of the European Union. Please keep in mind that people in the UK drive on the left-side of the road. If you are planning to travel to different locations in the UK, you might want to check which roads have a toll system. There are just a few of them, but it is wise to know beforehand if you will encounter any. Please check the website here: Toll-roads & charges UK government. Here are a few things that should not be missed while traveling along this famous route. Since the first Guinness Book of World Records was released in 1955 people have been struggling to get their name the book. One street in Scotland made it with ease, though! Ebenezer Place is located in the little town of Wick. It is credited as the shortest road in the world with a record-breaking 2.06 m (6 ft 9 in). The street has only one address which belongs to the restaurant No 1 – Bistro of the Mackays Hotel. A coastal drive through Scotland would not be complete without a pristine view of the sea. The Black Isle is the perfect location to relax your mind as the location is famous for having a large variety of beautiful nature and wildlife. One of the areas biggest attraction is its pod of resident bottlenose dolphins. Close to Chanonry Point, the dolphins can often be seen jumping and playing around in the Moray Firth. There are several “dolphin watching” tours that offer daily trips during the high season, but shut down during the winter period. The Black Isle is also great for fanatic mountain bikers as Learnie Red Rock has some excellent forest trails for you to explore. The bottlenose dolphins are a common sight around the area. Discounted Inverness & Black Isle Tours – Click for more information! A North Coast 500 trip is not complete without finding some entertainment along the way. If music calls to you in all forms, you should not miss rural music festival known as the Loopallu Festival. This event is held on the last weekend in September each year. If you like talented entertainment and to sing all weekend, you should not miss the opportunity to go. Loopallu festival at the North Coast 500. Time to party! When you visit the Dunrobin Castle Falconry you can see the Scottish wildlife up close and personal. The castle offers daily demonstrations in which Golden Eagles and Peregrine Falcons showcase their acrobatic hunting and flying skills. There is also an option to meet and great a real European Eagle owl. Visit the Dunrobin castle falconry to get face to face with real Scottish wildlife! Each show offers unique photographic opportunities with the birds and is suitable for adults and children. If you are tired of driving all the time, our friends at Walking Highlands set out a beautiful hike right next to the ocean. This beginners hike is perfect for the whole family and is 8 km long and takes about 2-4 hours to walk. Located right next to Loch Ness, Urquhart castle was once one of Scotland’s largest castles. During the war of independence the ownership of castle was passed back and forth between the English and Scots. It was a back and forth battle untill the 1500s when the last troops blew up the castle when they evacuated. Full-sized trebuchet present. That actually works and can trow very large rocks. Discounted Loch Ness & Urquhart Castle Tours – Click for more information! Highlands Unbridled is one of the most well-known horse & pony trekking companies in Scotland. If you wish to enjoy your vacation riding a horse through the Highlands than this is the place to be. This is the only company in Scotland that offers long trails where you go with a group of people and ride through Scottish wilderness for 7 days straight. Now that sounds like a great adventure, does it not? Check out their website for the different packages and always book well in advance to avoid disappointment. If you make a stop at Dunnet Head, make sure to visit the famous Dunnet Head Lighthouse. This 19th century lighthouse is located on top of a 300 foot (91 meters) cliff and was built-in 1831 by Robert Stevenson. It is the most Northern part of mainland Scotland. Right next to the lighthouse are several large grass areas that are perfect for wild camping. Just keep in mind that a lot of wind and harsh weather conditions are common in this area. Scotland is a very hospitable place to visit. There are many places to camp along the North Coast 500 route, but you should not just take up your temporary residence anywhere. We made an overview of the best accommodations, where to find them and what rules to follow. Also perfect locations if you wish to do a smaller road trip in Scotland! This adorable little cottage is located in the center of Applecross, above Shore Street. It is a ten minute walk from the award-winning Applecross Inn, the newly opened Junction Bistro for breakfast, and twenty minutes from The Applecross Walled Garden. Although, this camping is slightly off-route, it is a must-see when visiting Loch Ness. Glamping is a luxury form of traditional camping and at the Loch Ness Glamping site you can stay in a real camping pod! These small round little houses come with all the necessary equipment to make your stay as comfortable as possible. Unfortunately, a date with Nessie the Loch Ness monster is not included! This camping is located on the cliff tops above some of the most beautiful beaches of Scotland. Sango Sands Oasis Campsite is located in the small town of Durness on the North West tip of Scotland. It is famous for having the best home-cooked meals. A charming part of Scotland is the quaint bed and breakfasts that are found in almost every Scottish town or village. Therefore, when you enter a new town, get out of the car for a while and see what is around. The locals will embrace the opportunity to converse with you and will give you good advice on where the best accommodations and restaurants are. After spending a wonderful time on the Applecross campsite, it is now time to hit the road again. In about an hours drive you will come across the beautiful Torridon Hotel. This luxury hotel is just what you need and is one of the hidden gems of the Scottish Highlands! Located near the city centre, Inverness Youth Hostel is the perfect hostel to stay at when exploring the capital of the Highlands. You can easily travel to nearby sights like Fort George, Clava Carins, Urquhart Castle and of course Loch Ness! Located in Durness, this family owned bed & breakfast has an excellent reputation for making the most delicious meals. If you love to try new dishes, the Churchend Cottage Bed & Breakfast is the place for you! You will find that many of these small hotels and bed and breakfasts take great pride in their work. They all have different themes and the owners will be more than happy to recommend a few interesting activities in the area for you to enjoy. This beautiful 12th century castle is located on top of a hill overlooking the town. It is known for having an excellent cuisine and stunning decorations. The hotel has 20 individual bedrooms and a restaurant/bar.They even say it has its own resident friendly ghosts, but we did not see them… yet! Definitely a place you want to visit during your NC500 travels. Wild camping is allowed in Scotland and there are many options along the NC500 route. You can set up your tent or motorhome and enjoy the beautiful Scottish outback. Wild camping in Scotland is allowed, but follow these important rules! There are a few important rules you need to follow, which are established in the Outdoor Access Code. The weather has always been an interesting topic when traveling through Scotland. People have said that in the Scottish Highlands it is possible to experience all four seasons in a single day, but if you look closely you will see that each season has a lot to offer. Traveling the NC500 during the spring is a great idea. The local flora and fauna of the Highlands comes to live again once the snow starts melting. This is a great time to go hiking, cycling and do other fun outdoor activities whilst seeing the Scottish mother nature in all her glory. You will also avoid most of the tourists as it won’t get very busy untill the summer months. During the summer period you will see all the villages, towns and cities organizing traditional Scottish outdoor events. These events include the famous Highland Games, Music & Dance Festivals, Culture & Kitchen Festivals and much more. The Highland Games are one of Scotland’s most popular events. In this event many strongmen showcase their strength and skill in several traditional exercises in which all contestants compete with each other. The atmosphere is great as large groups of people will surround the contestants and cheer them on as they try to lift, trow and pull the impossible. Check out the HighLand Games Events Calendar here. If visiting the countryside is your thing than visiting Scotland during autumn is something you will never forget. The astonishing combinations of gold, red and brown colours will leave speechless on your countryside walks. During this period you can visit the traditional Scottish Autumn Festivals that are focused on the upcoming winter and lots of food & beverages .. And I mean a lot of them! “Driving the North Coast 500 during the winter? Why would I do that?” Because Scotland actually has a very active winter season, which includes a large variety of winter sport activities like skiing, snowboarding and ice-skating. During the wintertime a lot of hotels, bed & breakfasts and campsites will be closed for the season. Double-check if your accommodation is indeed operational if you wish to travel the NC500 during the winter. The North Coast 500 in Scotland may not be the fastest way to see the country, but who wants to be in a hurry anyway! People attempt to see all they can see within just 5 days, but that truly does your experience a disservice. Take your time along the way and get to know Scotland for its beauty and hospitality. I recommend a minimum of 7 days. The greatest thing about the NC500 is that no matter how many times you take it, there is always more to see and do the next time.